The Maze Craze at Galloway Farm in Hallsboro, NC provided a unique and refreshing twist to our line of Teen Science Cafe’s at NCMNS at Whiteville. While a normal Cafe involves an interactive, informational conversation along with a critical thinking activity or two inside a classroom-like area, our October 2016 TSC occurred outside, beside a corn maze, where we got up close and personal with nature. A corn maze is cut out of a corn field. The first corn maze was in Annville, Pennsylvania. They have become popular tourist attractions in North America, and are a way for farms to generate tourist income. Many are based on artistic designs such as characters from movies. Corn mazes appear in many different designs. Some mazes are even created to tell stories or to portray a particular theme. Most have a path which goes all around the whole pattern, either to end in the middle or to come back out again, with various false trails diverging from the main path. Established in 1944 with the purchase of its first tract of farmland, Galloway Farm has been family owned and operated for four generations. Growing over the years to include the production of beef cattle, corn, hay, soybeans and wheat, in 2011 Galloway Farm ventured into agri-tourism with the opening of the largest Corn Maze in eastern North Carolina, with over 13 acres of land. The maze is designed and cut with precision, providing their guests with a fun and challenging adventure of twists and turns to keep them going and going. Your goal is to find as many checkpoints as you can and find your way back out. After receiving an enlightening fill in about the maze, we were released to go explore in the winding maze itself! 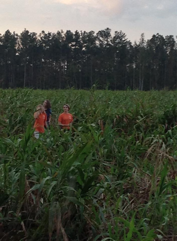 Not only did we have to figure out how to maneuver through and ultimately escape the maze, we were also expected to record checkpoints that were located deep within the paths cut through tall corn stalks that actually survived the wrath of Hurricane Matthew. This TSC adventure proved not only to be thought-provoking, but fun and exhilarating at the same time!